This is the busiest flying week of the year and a good time to reflect that the journey, not the arrival, is what seems to matter more than ever these days. That's because flying from A to B is the toughest part of any trip. 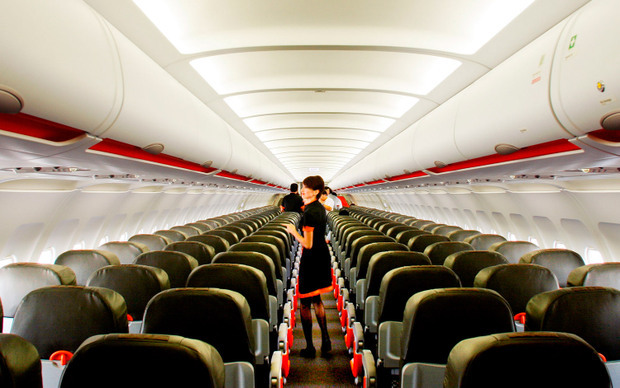 But if you're proactive, you can make your next flight experience easier and maybe even seamless. The good news is that with a little knowledge and some advanced planning, you can avoid many of the most common air travel snafus. You can quickly get monthly on-time performance statistics by airport, airline and flight from the Bureau of Transportation Statistics. But before you get bogged down in the numbers, eyeball your chosen flight's on-time record. That's the single most important stat to crunch. For example, Jet Blue's Flight 155 from JFK to Orlando departs New York at 6:59 p.m. and was 21 minutes late on average for the first three months of 2009. A better bet is Jet Blue's flight 71, which departs JFK at 6:30 a.m. and arrived an average of four minutes early during the same time period. If you're dreading the wait time in an airport security line, it's harder than ever to discover how long you'll be standing there in your socks. Flight Stats no longer provides information and The Transportation Security Administration's (TSA) is constructing a new Wait Time Calculator. But since we're talking about the government, don't expect anything to happen soon. Instead, visit the web site of the airport you're flying from. For example, Hartfield Jackson Atlanta uses Trak-a-Line. You just fill out a form with your approximate flight departure time and your e-mail address. They'll notify you via e-mail when there are changes to the wait times at the security checkpoint lines. Pack light. That's the only way to get any break on the roster of new checked baggage fees that the airlines have implemented. While most airlines will now charge you for checking any bag, they have radically raised the fees for bags that are too heavy, too big or count as a third bag. And the additional charges on that renegade bag can quickly add up to the cost of your airline ticket. American Airlines charges $20 for the first bag, $30 for the second. An excess bag is $100. An overweight bag, which is any bag weighing 51 to 70 lbs, is $50. A bag weighing 71 to 100 lbs. is $100. Any bag over 62 linear inches (total length + width + height) and will run you an additional $150. If your third bag hits the trifecta as excess, overweight and oversized, you'll be charged $350 for that bag alone. One of the only constants about flying is that the first flight of the day is the one least likely to be delayed. If you need proof, visit the Bureau of Transportation Statistics and see what the average delay is for the first flights of the day, even from perennially busy airports like LaGuardia and O'Hare. You not only will get where you're going faster, you will actually get to where you are going. One other first to remember: Always be among the first to board your flight, not the last. If the plane is overbooked and two people are assigned the same seat, the first one seated gets to keep it. Many of the traditional carriers from New York to London, such as British Airways and American Airlines, seems to be in cahoots on high fares. But not Air India, which flies from New York to Mumbai via London. Seats on that New York to London leg are often competitively priced. The same is true with Jet Airways, which stops in Brussels on its way to Mumbai. And if you're heading coast to coast, Cathay Pacific has a non-stop between JFK and Vancouver that offers wide-body 747 comfort and less than full plane loads is especially good at uncovering these flights. Your best offense is a good defense, so be prepared to insulate yourself. That starts with noise-cancelling headphones connected to your favorite tunes on an iPod. 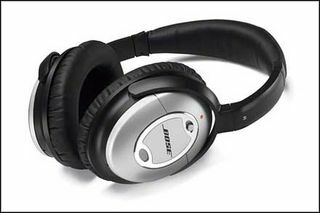 Bose makes terrific but pricey headphones, at $299 a pop, so consider a less costly alternative like the Sony Noise-Cancelling headphones on Magellans.com. Add in an eye mask and bring your favorite lightweight fleece along for warmth. Comfort zone established. 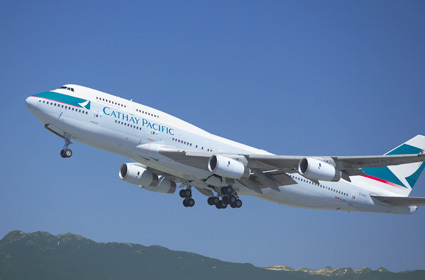 More than 170,000 fliers opted to be bumped from the 19 major carriers in the first three months of 2009. But don't jump at a carrier's first offer. 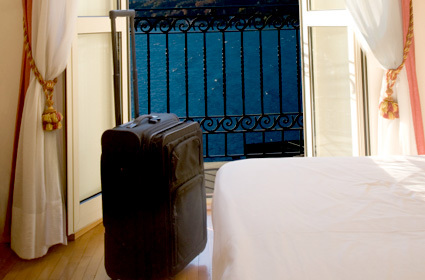 Will the airline pay for your meals, a hotel room and ground transportation should you have to stay overnight? Give you a pass to enter their airport lounge while you're waiting? When it comes to the actual compensation, choose a dollar voucher over a "free ticket," which can be highly restricted. 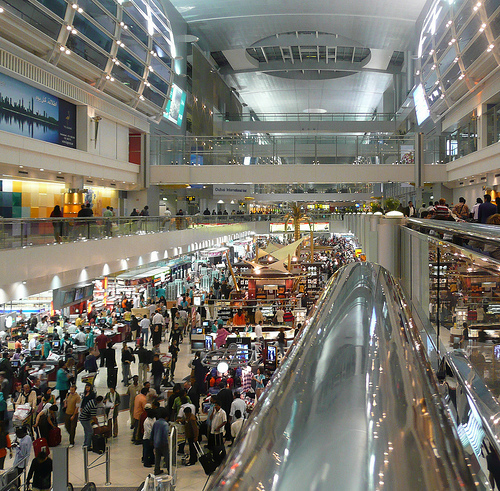 A dollar voucher can usually be applied to any airfare. As you're booking, look at the type of what aircraft you'll be flying on. 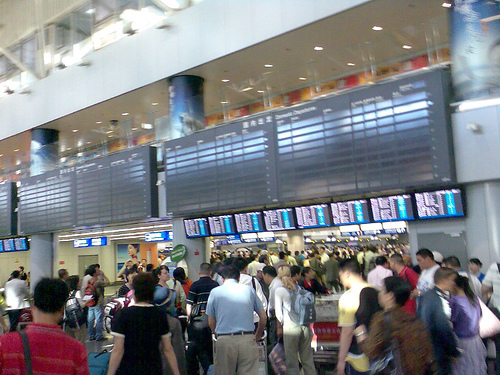 That information is on every airline and online travel site, either in the reservation or a click away. Then consult seatguru.com, not only to see how a given plane is configured but also how each airline configures their aircraft. For example, on an American Airlines 757, row 16 seats will not recline because the exit doors are right behind them. But on a Continental 757, it's row 14 seats that are a problem and won't recline. West on Books: David Byrne's "Bicycle Diaries"
Travels with Larry Olmsted: Why Are We Still Bringing Guns to Airports? Great tips! 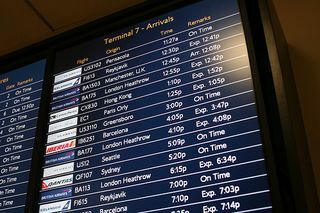 With regards to #6-it’s important to note that airlines do not always keep up to date information with regards to delays when the cause is weather. Recently, I flew with VirginAmerica. I kept checking my iPhone for updates. First it showed a 2 hour delay, then a 3 hour delay. I opted to wait at my hotel instead of at the airport. When I arrived at the airport, to my dismay-my flight had already taken off. In fact, it took off on time. I checked the website again and it showed that it was still delayed (while the plane was indeed in the air.) I even showed the rep at the counter-but she just shrugged. They left 15 passengers behind-who like me, were under the impression that the flight was delayed. While this was clearly the fault of Virgin America-they take no responsibility for delays (or delay time change) and still expect you to wait at the gate if your flight is delayed because of weather. This way, if it clears, they will board quickly and take off. Sad, but true. I tell everyone to skip the extra luggage. Get everything into a carry-on. Even if you have to launder a few pieces of clothing at high hotel prices, you may come out ahead of paying for extra baggage.